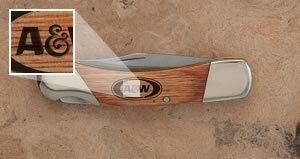 Laser engraving is used to mark into wood surfaces, metal handles, leather knife sheaths and flashlights. This process uses an intense light beam to permanently replicate your name, logo or graphic within 1/600th of an inch. Protective preservative seals all laser engravings into wood. The process appears dark on wood and white on colored aluminum. Color fill is not necessary nor recommended. Laser engraving is not available on any plastic knife handle.